It’s no secret that Franklin BBQ in Austin, Texas is one of the most popular and acclaimed barbecue restaurants in the country. The waits are so long, that the line to get inside even has its own Twitter account. If you, like us, are nowhere near Austin, we have found something to tide you over: a BBQ-centric YouTube series by Aaron Franklin, “Barbecue with Franklin,” which covers BBQ tips, recipes and techniques. Here, in the first video, Aaron walk us through the process of preparing a brisket! This series is putting us in the BBQ mode, so hopefully some BBQ weather will be right around the corner. Our favorite part about Lillie’s Q (1856 W. North Avenue, Chicago) is their impressive selection of regional BBQ sauces at every table: six at last count, each representing a distinct BBQ region. Sampling all of the sauces at Lillie’s Q is like taking a crash course of all the major BBQ sauces in the US (for context, check out this BBQ map graphic we previously posted). As you travel from region to region, what is called “Barbecue Sauce” varies wildly, and trying them all is half the fun. If you haven’t visited Lillie’s Q yet, here’s what to expect on your whirlwind tour of US Barbecue. Carolina Gold – Yellow, mustard-based sauces are typically found in South Carolina, thanks to the influence of German immigrants. This is probably our favorite kind of BBQ sauce, no doubt because we first cut our BBQ teeth in South Carolina. People used to North Carolina sauces will find South Carolina’s specialty to be nothing short of sacrilege, but we absolutely love it. This rendition was pretty good! Carolina – As NC and SC continue to debate which is the real “Carolina,” North Carolina has a friendly debate of its own: whether western (“Lexington” style”) or eastern North Carolina barbecue should reign supreme (the North Carolina general assembly actually proposed a series of bills to resolve this debate). What Lillie’s calls “Carolina” sauce is typically associated with western North Carolina. Perhaps Lillie’s is taking a bit of a stand here by referring to the sauce only as Carolina, but perhaps they are also speaking to how this sauce is most commonly associated with NC BBQ outside of its home state. Typically used only on pork shoulder (the basis of Lexington style), this is a thin, vinegar-y sauce with some tomato and pepper flavor, it carries a little sweetness, but is overall tangier than other sauces. E.N.C. (Eastern North Carolina) – Again speaking to an important regional divide, Eastern NC BBQ utilizes the whole hog, and its sauce differs from Lexington style on the tomato-base: E.N.C. sauce has none. This is the thinnest and tangiest sauce – pure vinegar and spice – without the sweetness of other sauces. Smoky – A sweet, thick tomato-based sauce with a lot of smoke flavor, Lillie’s bills this as a Memphis-style sauce, and it shares many similarities with Kansas City BBQ sauces. It is the most popular sauce at the restaurant, and is probably the most familiar kind of sauce to the Chicago palate. Hot Smoky – The same Smoky sauce with a slight Cayenne Pepper kick, but not too much at all. Ivory– This mayonnaise-based white sauce was a particularly unusual option, and one we have never seen in Chicago before. Unknown to many outsiders, it is most commonly found in Alabama (especially northern Alabama), and is commonly used to dress barbecued chicken. It tastes somewhat like a thin ranch dressing, but with fewer spices. Lillie’s also encourages you to use this one as a dip for fries. We were jonesing for some BBQ while heading out of Champaign, IL. 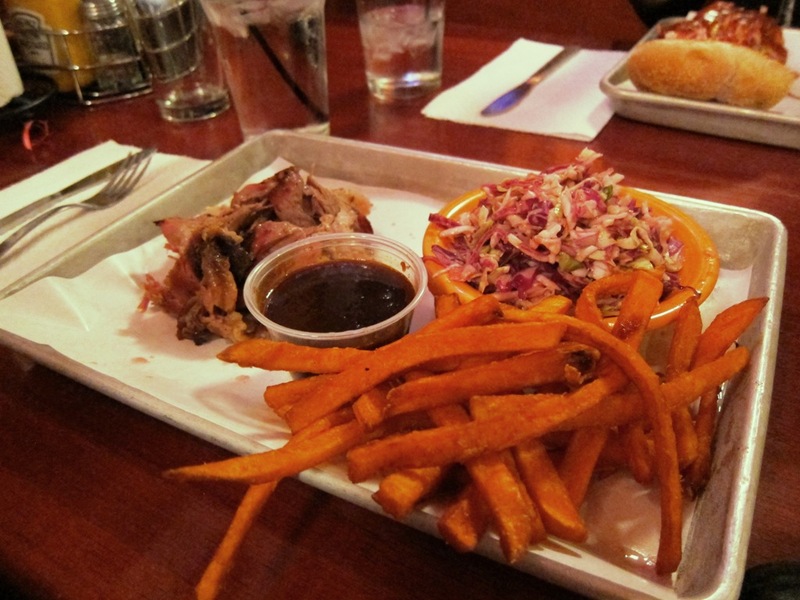 We didn’t want to have a sit-down meal at Urbana’s well-known Black Dog BBQ (which we have visited previously, and highly enjoyed); but we also weren’t willing to wait until we got back to Chicago (2.5 hours later) to eat at Smoque. In downtown Champaign, we drove past a trailer in the parking lot of the Tumble Inn bar with a hand-painted sign that said “Chester’s BBQ.” We figured we had to try it. We were disappointed at first, the trailer appeared to be open but empty, and me, with my official BBQ shirt on, had to wait around until the owner returned to the truck in 15 minutes. We used the time to settle on a menu selection: an order of the “Award-Winning Pulled Pork” and a side of what was called “Broccoli Slaw.” (total of $8 – a free side was included). The slaw was a mix of broccoli florettes, bacon, feta, cranberries, tossed in honey vinaigrette dressing. It definitely was an unorthodox side, but if you’d prefer there is also some classic slaw and potato salad. When the owner returned – we quickly ordered two pulled-pork sammies. The pulled pork was excellent. The smoke flavor was well-cultivated, and the meat stood very well on its own without any of the sauce (which you add yourself). We devoured it – flavorful, smoky, and addictive, on a bun that was so unnecessary we just used it to dip in the sauce. They change their sauce every week, and there are three levels of heat (mild, medium and hot). We went with the hot sauce, which had a little kick, but not too much; this week a fruity North Carolina style sauce with tomato and vinegar. Chester’s is a competition BBQ truck, and for now is only parked at the Tumble Inn after 5 PM on Fridays and Saturdays, but it’s definitely worth the wait. Chester’s was just as good, if not better, than Black Dog – we hope they can expand their operation in Chambana, because the area could always use another great BBQ option. 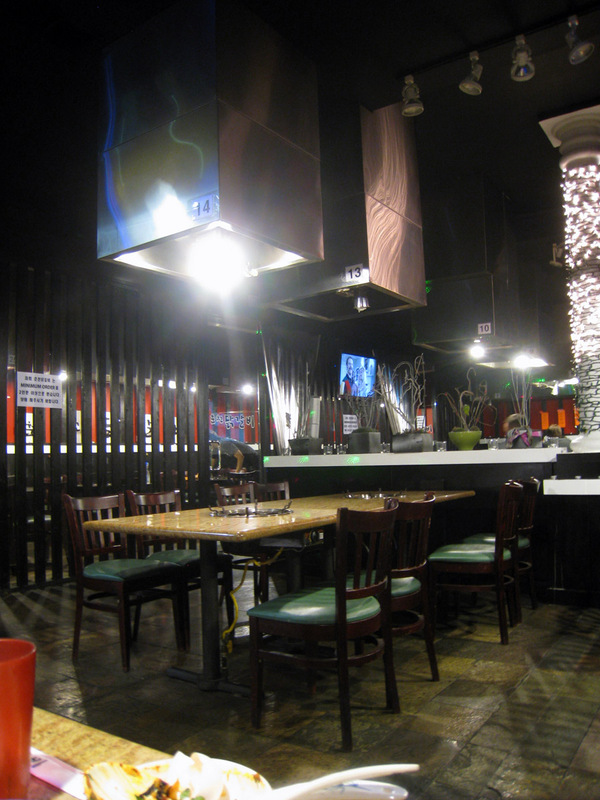 Chester’s is a great hidden spot we hope won’t stay hidden for long. Every year or two we take a family trip to Charleston, South Carolina, and one of our chief goals is to eat as much Barbecue as humanly possible. This year our trip was curtailed due to graduation, but we still managed to get a little BBQ in during our short stay. Sadly, we were unable to make it out to Sweatman’s in distant Holly Hill, one of our favorite ‘Que places in the world. However, we found some BBQ joints closer to where we were staying, including Melvin’s. Melvin’s is part of South Carolina barbecue royalty, the Bessigner family, which has been running restaurants in the area for the better part of the century. We felt we had been spoiled by Sweatman’s amazing Mustard sauce, though we hear they have changed owners since our last visit. Don’t let the location of Melvin’s in the outlot of a stripmall deter you. The restaurant may look a little too new, and perhaps even touristy, but the turnover is high meaning fresh food, and the smoker is legit. The menu at Melvin’s is surprisingly extensive, with chicken, pulled pork, brisket and pork ribs, sandwiches, platters and even burgers. The specialties are ribs and chicken, but we had to order our old standby, a pulled pork platter (which happened to be on special that day). We also tried some of the ribs and chicken ordered by the rest of the family, which are the restaurant’s specialties. We judge pulled pork on how soon we reach for the sauce after sampling the meat. Good pulled pork should be able to stand on its own, without being doused in sauce. We thought the pulled pork at Melvin’s was excellent – it had tender meat, good moisture, but not too fatty, and a pleasant smoke flavor. The meat itself does not come with sauce – it is provided on the table – you have a choice of iconic South Carolina mustard sauce or a sweeter tomato-based vinegar sauce. We tried a little of each, but we had to go with the signature mustard sauce. However, we pretty much sopped up everything with the delicious golden mustard sauce which was the perfect mix of tangy, spicy and sweet. There was a wide array of side dishes but we went with our favorites again: macaroni and cheese and corn bread. Sadly, the mac and cheese was very disappointing: a complete mush with very little cheese. 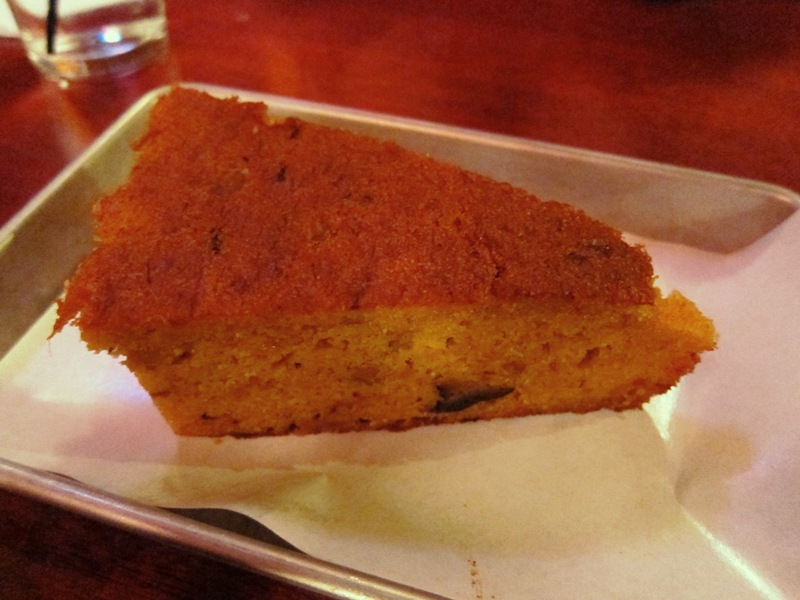 The cornbread fared better on our rating scale, but the Que was definitely the star. The ribs we sampled were also very tasty, if a little dry, we preferred the pulled pork. Our drink of choice, was of course, sweet tea, though we also ordered an unconventional-for-a-barbecue-place Oreo milkshake ($3.99 for a large). And as always, we had to splurge for some banana pudding for dessert! We were also pleasantly surprised that all of the sauces were for sale at surprisingly cheap prices, so we bought some mustard-based sauce to take home. Overall, Melvin’s is a great go-to South Carolina BBQ spot with some excellent mustard sauce in a convenient location. We still miss Sweatman’s but it helped ease the pain a little. Happy Barbecue Week at ETW! At home and abroad, finding great barbecue is one of our true passions. Cooking meats low and slow over a flame with various seasonings is a worldwide tradition, and we are excited to celebrate it this week as we highlight some of our favorite barbecue food finds from both the US and around the world. We recently picked up a new cookbook/guide, Big Bob Gibson’s BBQ Book, which has really made us hungry to try some more recipes in our own kitchen (no smoker yet, sadly). The book by Chris Lilly (pitmaster at the Big Bob Gibson Bar-B-Q in Decatur, Alabama) is one of the coolest, most informative books we’ve read in a while. If you’re interested in learning the techniques of US BBQ, we highly recommend it. Of course, in the US, BBQ certainly doesn’t mean one single thing, and every region has their own unique take. Check out this infographic for a cheat sheet to the major BBQ regions, and get ready for ETW BBQ week. Happy 4th of July! A classic American 4th of July means barbecue, so we are excited to share a few new Chicago BBQ-related links for those in our neck of the woods. First and foremost, the Serious Eats ranking of the best pulled pork in Chicago. Lillie’s Q comes out on top, and our perennial favorite Smoque comes in 2nd place. Chicagoist has their own recent roundups of the top BBQ overall in Chicago. For something a little different, Time Out Chicago dishes on their pick for the best new BBQ joint in Chicago, Bub City. We have often said that one of the things we miss most when we are in Brazil is American Barbecue. However, we have just learned about an American BBQ joint in São Paulo, BOS Barbecue (Rua Pedroso Alvarenga, 559, Itaim Bibi, São Paulo). BOS BBQ is run by a team of Texans and Brazilians, and there is even reported to have the first American BBQ pit in all of meat-obsessed Brazil. BOS specializes in ribs and pulled pork and has several varieties of BBQ sauce to choose from (Espresso, Honey and Classic). First macarons and now BBQ – we could definitely live in São Paulo! 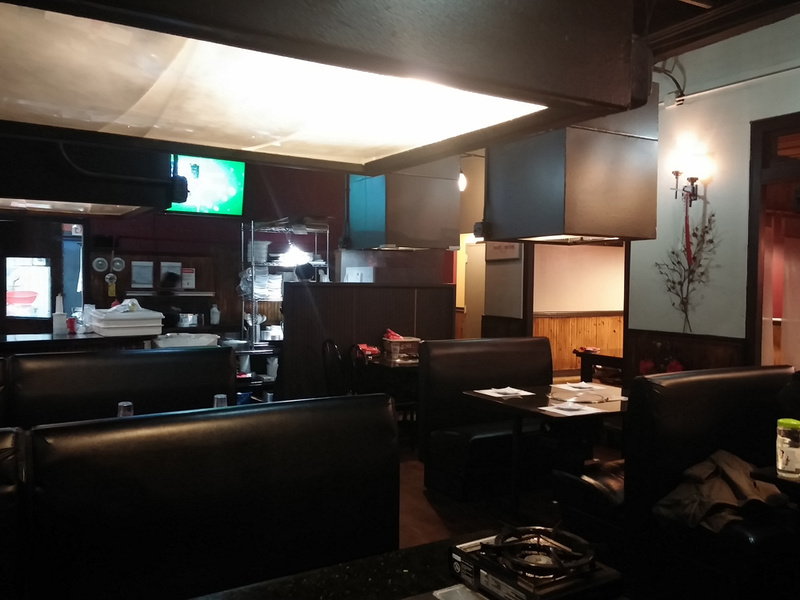 Here is a complete review of BOS BBQ in Portuguese. You know we love us some BBQ – and we’ve tried to explore all of the options in Chicago – sometimes even venturing into the heart of BBQ country in the south. However, sometimes you can find BBQ in unexpected places – like central Illinois. In an unsuspecting building, this little restaurant is turning out some excellent Que. Black Dog BBQ is almost always packed – even at 9 PM on a Sunday – you put in your number with the host, who on this particular night was the owner of the restaurant. When we arrived, there was about a half an hour wait for a table or booth in the narrow restaurant. We ordered a piece of Blackdog Cornbread ($2.95) which contained green chiles, cheese and pulled pork. The cornbread was good, but perhaps a little over-full with mix-ins. The pulled pork was excellent and tender, but not too fatty and the Carolina sauce had a nice vinegary flavor with some zing. M opted for a pulled pork platter with Texas sauce, and thoroughly enjoyed the slight ancho kick. However, we noticed that the platter didn’t actually seem to have any more meat than the sandwich – so keep that in mind when ordering. We are pleased to report that Black Dog has some of the best BBQ we have had recently, full stop, and it is hands-down the best BBQ in the Champaign-Urbana area. When visiting the University of Illinois we now have a new go-to place, that is if we can get a table. Though we consider ourselves open-minded eater, we have not had good luck with Korean food, so we had kind of crossed it off of our list of “try-again” cuisines. Fortunately our fortunes have turned and we were introduced to some amazing Korean food on our Californian adventure. Our friend K lives in K-Town in LA, known to have some of the best Korean food anywhere, so we were excited to try one of her picks for Korean BBQ. When we were greeted upon entry – the server proclaimed she needed to find the English menu – which, humorously enough, did not even contain any English. Our friendly English-speaking server was very helpful, walking us through the Kalbi process. We ordered 2 orders of the regular Kalbi and one order of the “fire chicken” especially for M, who is, as we know, a fire-breather. 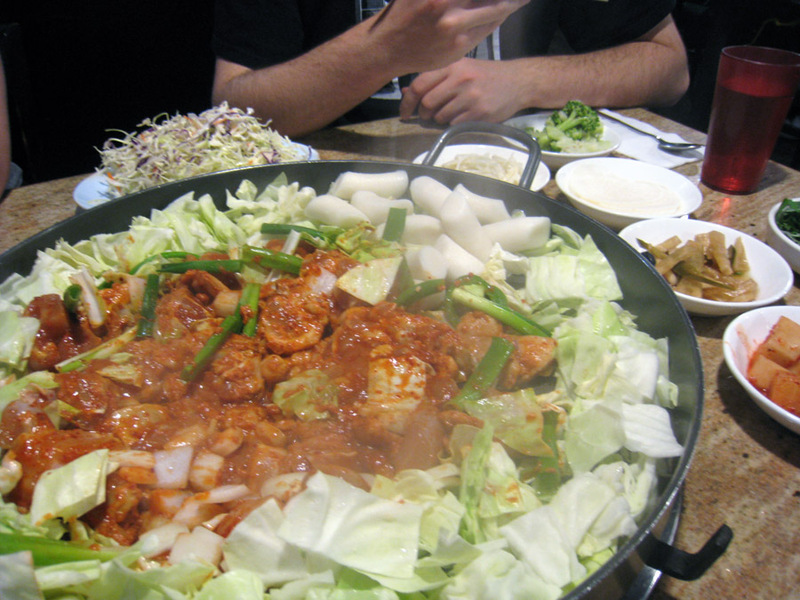 As is the tradition in most restaurants specializing in Kalbi, the dish was cooked in a giant hot plate right on the table in front of us. It also came with a small assortment of banchan (side dishes), including radish wraps, cole slaw and seaweed. M proclaimed that the fire chicken was one of the best spicy dishes he had ever had (but of course it was not TOO spicy). The “regular” chicken kalbi was also stellar, and the sauce was a perfect mix of sweet and spice, and came cooked with scallions sweet potatoes and rice cakes. After the meal was (mostly) over – the ends of the kalbi were mixed into fried rice right in the hot plate by our server. After the meal was completely over we got a tiny cup of tangy frozen yogurt (a la red mango). We were definitely impressed with our meal, and were completely stuffed. 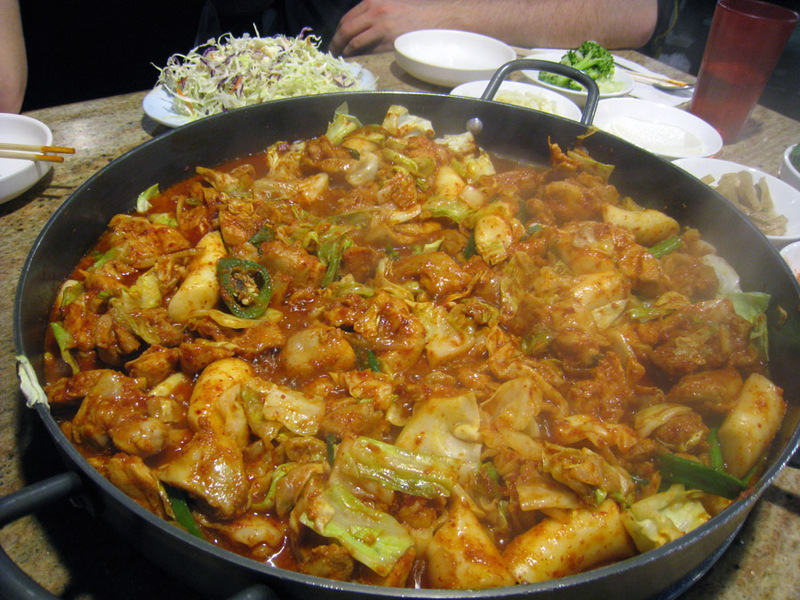 With our LA experience we officially re-introduced Korean food into our cuisine rotation. When you see a restaurant with whole roast ducks hanging in the window you know you’re in for some good food. The updated Sun Wah space is a veritable palace of meat, with Peking duck window-dressing and a freakishly large menu pushing everything from Chilean Sea Bass to Pig Intestine. Upon entry there was already a massive queue in front of the takeout counter, but ample space to sit down inside. You know you will be getting huge quantities of meat at Sun Wah, but the prices are even more killer. There is an entire page of meat combos that provide you with a choice of two of the following: duck/pork/beef/chicken with various sauce permutations on top of a mountain of rice. To start out with we ordered a bowl of Hot n Sour Soup ($4.25). The bowl was gargantuan and arrived in barely a few minutes. In quick succession the rest of our meals arrived: Salt and Pepper Chicken and BBQ Pork ($5), Roast Pork and BBQ Chicken ($5), BBQ Duck ($5). The salt and pepper chicken was unfortunately a little “mystery” for us and contained what looked like a quarter of a chicken hacked into cubes, bones and all. The pork dishes were more successful, and the roast pork had a delicate flavor while the BBQ packed a sweet and sour punch. The duck came with a generous portion and was absolutely roasted to perfection. One warning though: come for the food – but hang on to your plates. Before we got to shovel in even half of the hot and sour soup – it was unceremoniously removed from our table by the waitress who did not seem to respond to our desperate cries of “WAIT.” Even sans soup we still ended up with another full meal out of our leftovers. We were totally impressed by Sun Wah, the food was amazing, at any price, but seriously, hang on to your plates!